Female Ceraphron, photographed by Tom Murray. Contains: Platygastroidea, Cynipoidea, Proctotrupidae, Chalcidoidea, Diapriidae. 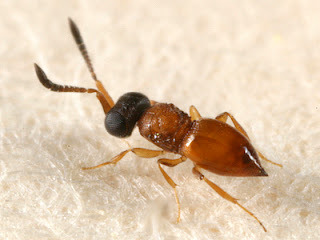 The Proctotrupomorpha are a diverse clade of small wasps, most of which are parasitoids though several subgroups have become phytophagous. See also: Taxon of the Week: To give Lovecraft nightmares. Characters (from Grimaldi & Engel 2005): Lower tentorial bridge of head intervening between postgenae to reach occipital foramen; medial scutal sulcus absent. [EM01] Early, J. W., L. Masner, I. D. Naumann & A. D. Austin. 2001. Maamingidae, a new family of proctotrupoid wasp (Insecta: Hymenoptera) from New Zealand. Invertebrate Taxonomy 15: 341-352. [G17] Girault, A. A. 1917. New Javanese Hymenoptera. Privately published (reprinted Gordh, G., A. S. Menke, E. C. Dahms & J. C. Hall. 1979. The privately printed papers of A. A. Girault. Memoirs of the American Entomological Institute 28: 59-71). [G25] Girault, A. A. 1925. Some gem-like or marvellous inhabitants of the woodlands heretofore unknown and by most never seen or dreamt of. Privately published (reprinted Gordh, G., A. S. Menke, E. C. Dahms & J. C. Hall. 1979. The privately printed papers of A. A. Girault. Memoirs of the American Entomological Institute 28: 191-193). [G31] Girault, A. A. 1931. A new habit in an old insect, Homo pudicus and new Eurytomidae. Privately published (reprinted Gordh, G., A. S. Menke, E. C. Dahms & J. C. Hall. 1979. The privately printed papers of A. A. Girault. Memoirs of the American Entomological Institute 28: 280-283). [G35] Girault, A. A. 1935. Microhymenoptera Australiensis nova, mostly Chalcididae. Privately published (reprinted Gordh, G., A. S. Menke, E. C. Dahms & J. C. Hall. 1979. The privately printed papers of A. A. Girault. Memoirs of the American Entomological Institute 28: 315-318). [R02] Rasnitsyn, A. P. 2002. Superorder Vespidea Laicharting, 1781. Order Hymenoptera Linné, 1758 (=Vespida Laicharting, 1781). In History of Insects (A. P. Rasnitsyn & D. L. J. Quicke, eds) pp. 242-254. Kluwer Academic Publishers: Dordrecht.